This month’s tea party was an exciting workshop based around some different mathematical objects which can be made with origami. Dr Nicolette Rattenbury of the School of Computing, Mathematics and Digital Technology at Manchester Metropolitan University was leading the workshop, and it was obviously a very popular theme, since the workshop was very well attended. We had a full house, and every table was packed with girl geeks ranging from kids up to big kids, eager to have a go at making things out of paper. The first task was to make a fractal out of train tickets. Nicolette kicked off by explaining that a fractal is a mathematical object which has repeated structure at different levels of scale – so if you zoom in on part of it, it looks like the whole thing. After showing us some examples of fractals, including the famous Mandelbrot set, she explained we would be making an approximation of a fractal called the Menger Sponge. 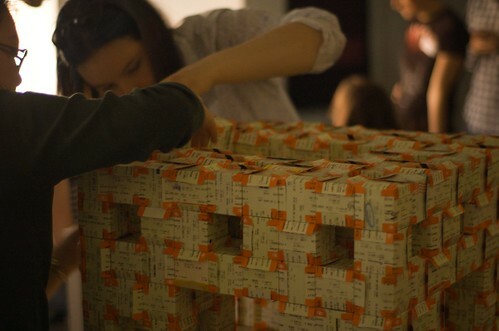 It looks like a cube with square holes punched through it, and we could make it entirely from train tickets. We were shown first how to fold each ticket to make the basic origami unit, then to assemble six of these into a cube, and then to make twenty cubes into a small sponge component. Twenty of these then made up the whole Menger sponge. 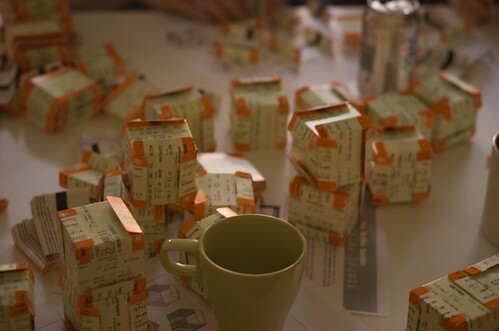 Everyone got stuck in to folding and assembling, and soon the tables were full of green and orange folded ticket cubes. While the final large cube was assembled, Nicolette showed us a second type of modular origami, called the Limping Seagull. By folding a piece of square paper in half twice, and making it into a shape with two pointy ends, these can be slotted together and built into lovely mathematical solids like the icosahedron. 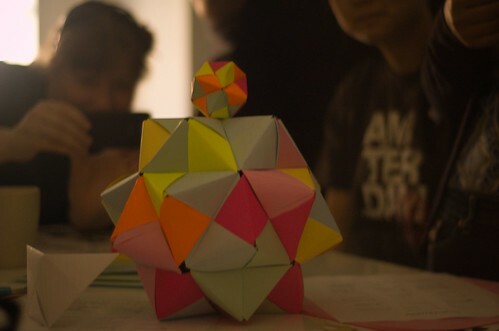 There was lots of brightly coloured paper available, and in no time we found several different multicoloured icosahedra had sprung up around the room. The overall result of the workshop was that everyone had a great time, and learned a fun new thing to make out of paper. “I didn’t think it was going to be that fun, making stuff out of train tickets – but I’m really getting into this!” one of the volunteers commented. 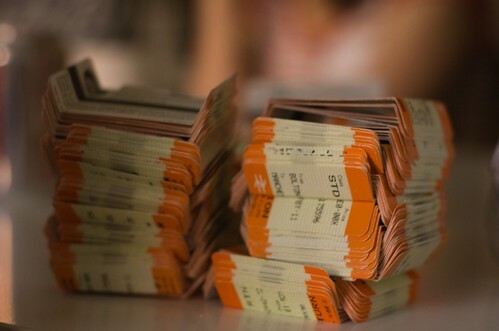 A prize of a MadLab tshirt was awarded to the attendee who brought the most train tickets, and MadLab now has a beautiful new sculpture entitled ‘The Shape of Public Transport’, made from train tickets and enjoying pride of place. Thanks very much to Nicolette and all of the volunteers for their help setting up and running the session. More photos can be found on our Flickr group.